The event is organized by Jewish Family Service and the Jacobs & Cushman San Diego Food Bank and sponsored by Westfield Horton Plaza, JIMBO’S…Naturally and Skechers Performance Division. 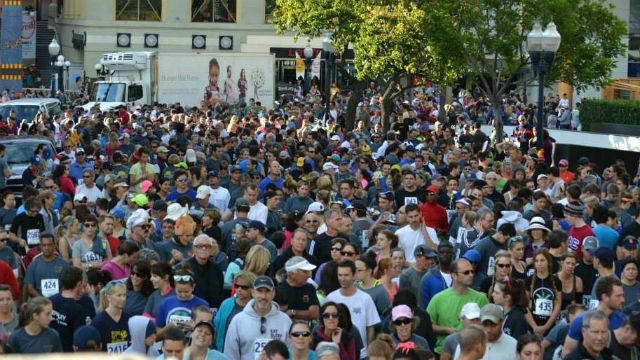 The 10K/5K run/walk begins at 8:15 a.m. at Broadway Circle in front of Horton Plaza, and makes its way through San Diego’s historic Gaslamp District and East Village. The early start times ensure that runners finish with plenty of time to return home and prepare Thanksgiving dinner. Proceeds from the race will benefit the Jacobs & Cushman San Diego Food Bank and Jewish Family Service’s food-assistance programs, both of which support individuals and families in need throughout San Diego County. Race organizers are inviting participants to wear Thanksgiving-themed costumes. Officials expect a large number of runners and walkers to dress in turkey, pilgrim, and pumpkin outfits which will add to the Thanksgiving holiday spirit. Approximately 4,500 participants are expected to run and walk in the event. Registration is available online at www.sdrunforthehungry.org. Participants can register on the day of the event. Registration for the 10K closes at 7 a.m. and registration for the 5K closes at 7:45 a.m.